• And convert advertising and marketing expenditures into accountable investments. 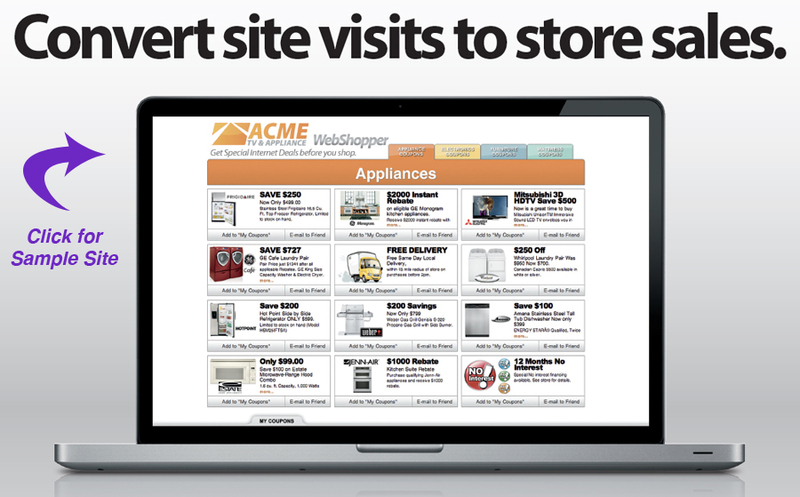 To see the user side of WebShopper in action, click the laptop above. WebShopper gives customers Special Internet Coupons Before They Shop with a simple, easy to use coupon selection interface. Installed as the home page of a retailer’s website, WebShopper merchandises attention-grabbing offers for customers to browse. The customer then selects one or multiple coupons. And after providing their name and email, the coupons are sent to the customer’s email account. The customer simply prints the coupon and takes it to the store for redemption. Web initiatives must be supported by marketing and advertising efforts to promote awareness and generate site traffic. So, WebShopper offers retailers a complete package of marketing support to include print ads, TV spots, radio spots, direct mail, broadcast emails and Internet banner ads. WebShopper is a full-service web deployment program that includes a WebShopper development and support team that will design, modify, install, train, launch and continually support the management of the program.